The trend in Nigeria now is to get the new national identity card, especially as most applications, if not all, now require this id. So I had no choice than to get mine. There are 2 ways of applying; there’s the fast process and the slow process (at least that’s what I call it). THE SLOW PROCESS : Basically, you head over to one of the data capture/registration centers. You would have to stay on a queue, take numbers and wait for your turn. and start afresh. THE FAST PROCESS : This is where being computer literate becomes useful. All you have to do is pre-register on the website and print out the slip with a bar code, then walk into any center and complete the process. I’m a very busy person, and computer literate, so, obviously, I went for the fast process. Just as a heads-up, there are currently 37 registration centers in Nigeria, with one located in each state. This is just wrong considering the fact that we have a state like Lagos that is basically overpopulated. But anyway, I digress. My Experience: After printing my slip, I headed over to the Lagos NIMC branch at Plot 1, Obafemi Awolowo Way, Opposite Alausa Secretariat, Ikeja – Lagos. Nigeria. When I got there, I was directed to come in , switch off my phone and sit in a particular section by one guy. It was really creepy because the guy I had to sit next to was staring at me through out. Anyways, I was called to get my height measured since I wrote crap as my height (Lool, I wrote 172cm, who dash me ??? ). After my height was measured, I had to wait for another 10-15 minutes, then my name was called. The attendant was quite nice and all she had to do was scan my barcode to get my details. She corrected some of my information, took my fingerprint and picture. After that, I was asked to wait again, I think for about 8 minutes. Then a temporary slip was given to me (apparently, the main Id card will be issued within the next 6 months). Likeee!!! Too terrible. i remembered the queue outside that day. LOOL. Its pretty simple. Just ask. Gawsh, do Cakes and I have to get this done too? I’m tired of doing data and identity cards. So i am thinking Cakes is the boo yeah ? Trying to do pre-registration online, on step 4 of 11 and it is no longer responding. I need help. Hey. so, all you have to do is refresh page and it continues from where you stopped. This happens a lot. Its the Nigerian system. Done mine . Didn’t know about the pre-reg. Had to stand for so long ! It was unbearable. Adamawa	Yola North	ADSO	Opp. The Scope Newspaper Behind Fed. Sec. Complex, Yola. Uyo	AK-UYO LO	Low Cost Housing, By Federal Medical Centre, Abak Road. Thks 4d info on national Id cards. It was really useful. Also, here’s a link that shows the location of national id card office centres across Nigeria. Just click on the link below..
thats how it suppose to be! because i also went through all that hahahahahahahah!!! Pleas, sir, I am Akingbade. about my ID CARD i did it last year november20 2014 . and i do a mistake then. my date of birth is not corect, i rote( 20 october 1967) insted of 28 november 1967) and i have been calling the office no body pick the call till today i email the office. Surnam Akingbade,first name iyiola, middlename lawrence .Gender MALE. pleas help me out ,sir/mar.GOD bless you. Thanks a lot for this review SandraGee; very helpful! Have you since received your permanent ID card? is the temporary slip as valid as the national id card, and have yu been able to get the national id now? I register since march last year,i have not heard anything about it. Can you please give me any information on how to collect my card? yeah so I just ignored the warning and proceeded. Hi Sandra. . . I’ve been tryn’na register and the site isn’t opening. . .Its showing an ‘Error’ page. . . Any advice on what I can do? Hmm. I think you should try again. It just went thru here. After the upgrading days that Nimc went on break to resume on the 19 december. I went to there awka anambara STate they said that work on registration have not resume as supposed and the don’t no when else they we re-start registration. Need to no if other states are work. How can i be a member, for registering peopple. I.e an agent. why is Nigeria so so deficient in many ways. ordinary to retrieve your password as regards the NICM is a problem. i think when trying to retrieve your password and the link to reset the password is been sent to your mail, shouldnt it be sent with your username. just fed up with the whole registration *ish……rubbish. i have caompleted my own registration and was given a temporary card since 2013 but up till now the original id card has not been issued to me pls what is holding you people? When will I get my id card enrolled since November 2014 or is there any site to cross check to know either is ready or not. Since July 21, 2014 I registered at Ojo Local Govt., of Lagos State with tracking no. S7Y0OG2YF0001XM and I was issued with Enrollment Transaction Slip, I have been visiting the LG to collect my National Identification Number Slip(NINS) all to no avail. I was told that my registration had a problem and that it will be rectified soon. How long will it take a nation of 55yrs old to rectify whatever problem caused by those who registered me. Please I need my NINS and my original I’D. My phone nos are 08037184588 and 08029240787. Hello there, I am using this medium to requested for my original National Identity card. 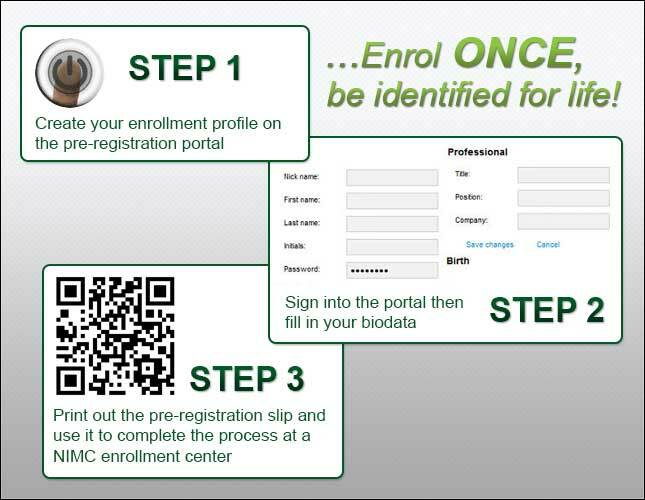 I did my enrollment since December 2013. What they issue to me was a slip. And then no text message or email concerned about the original card. I went to the office which I did my registration I was told that they selected some persons and print their. Is it not bias? Of a truth some gotten their original card. Then my question is what happened to the others who are yet get their own? When are we expecting them? Particularly my own? pls i want to know why now i didnt receiving notificatn dat my I.D card is ready since 20-03-2014 pls let me know reason. i want to use this medium to beg the nimc, i have enrolled since 17 of August 2015 up to now i haven’t receive my slip I D please i am in really in need of it. my tracking ID is S7ONYFHU0006M6. PLEASE DO IT FOR ME. I am Endurance Omorotionmwan. I have enrolled for nimc I’d since August 17 2015 to this month of December all to no avail ever since I went there throughout August to December all they told me and still telling me is that the slip I’d is not ready, and now i was ask to come February 7 2016. please nimc I really want u to intervene. please if i can just get the slip id if not the plastic now please i will really appreciate. my tracking id is S7YONYFHU0006M6, REG centre EDSO-SEAMFIX, please this my number 08183861392 or 08123761205. in case any solution. if somebody like me wants to know if his/her id card is ready, how can such individual be notified knowing fully well how the system works here? I am in dire need of mine. i registered last year, i was given a temporary one with the assurance that the original copy would be ready soon? how do i know when mine is ready? Thank you. Wow! Must be very frustrating. Did you try doing the application online? Please I registered for my national identity card since 13/10/2016 and up till today I have not been given the temporary card. It is getting frustrating as I want to use it urgently. Here is my number 08062430296. Amuwo Odofin Local Govt collects 400 naira for this process. Is any Govt agency meant to collect money for this? Please I registered November18 2016. And till date I have not gotten the temporal one I have bank issue and I need to use this. I have gone to my site of registration they are saying internal error and I don’t get it. What is causing this error and how can it be rectified I need this urgently please who can help me!!! Hello, good morning. i had a problem with my registration and was wondering if you help proffer a solution to my problem. last year, i went to the NIMC office in Abuja and after answering all the questions and filling the forms, i was told that my name was appearing in the system as someone who had gone through the process before, which is not true. i was given a temporary slip, pending when the issue would be rectified but up until now, nothing has been done. please is it advisable to register online or do i still wait for the issue to be rectified? Hello, pls I did my ID card since January till nw is still under review. Visit us today for all your Customs clearance needs in Nigeria!